The parallel lines etched on the side of Mount Jumbo are testimony to a series of dramatic geologic events, the Lake Missoula Floods. Occurring as recently as 15,000 years ago, the floods resulted when the Clark Fork River, which had been dammed by glaciers near the entrance to Lake Pend d’Oreille near Sandpoint, Idaho, broke through its constraints. As the melting glacier dam failed, an estimated 200 to 400 cubic miles of escaping water created a river that contained ten times the water of all the rivers in the world. The torrent rocketed downstream with a force that tore through 3,000 square miles of Columbia Plateau, carving magnificent geologic formations in its wake. one of the most significant geological events in the history of the world. Location. 46° 51.979′ N, 113° 59.05′ W. Marker is in Missoula, Montana, in Missoula County. Marker can be reached from the intersection of South Van Buren Avenue and South 5th Street East when traveling north. Touch for map. 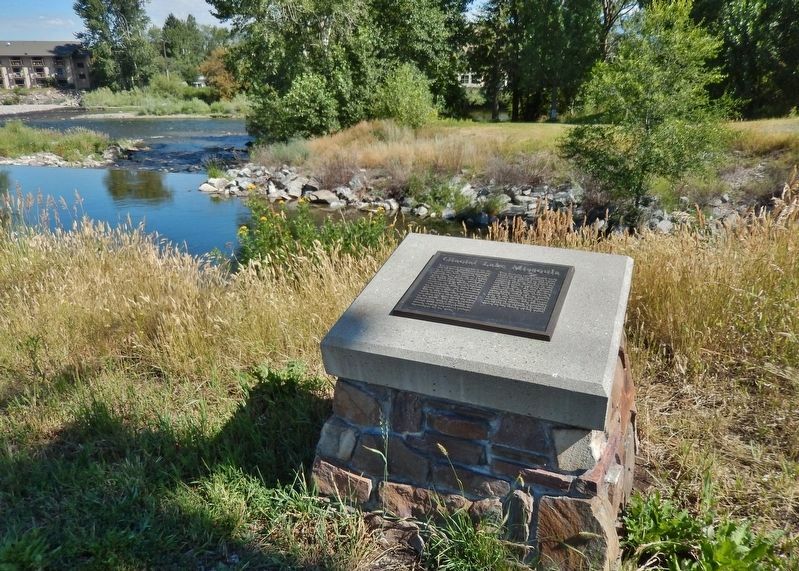 Marker is located along the Kim Williams Trail, near the Riverfront Trail intersection, overlooking the Clark Fork River, just north of the parking lot at this intersection. Marker is in this post office area: Missoula MT 59801, United States of America. Touch for directions. Other nearby markers. At least 8 other markers are within walking distance of this marker. Rattlesnake Creek (about 600 feet away, measured in a direct line); Draper Residence (approx. 0.4 miles away); Federal Building & United States Post Office (approx. half a mile away); Free Speech Corner (approx. 0.6 miles away); Danger Ahead! (approx. 0.6 miles away); A Shortcut (approx. 0.6 miles away); Name That River (approx. 0.6 miles away); Northwest Passage (approx. 0.6 miles away). Touch for a list and map of all markers in Missoula. More. 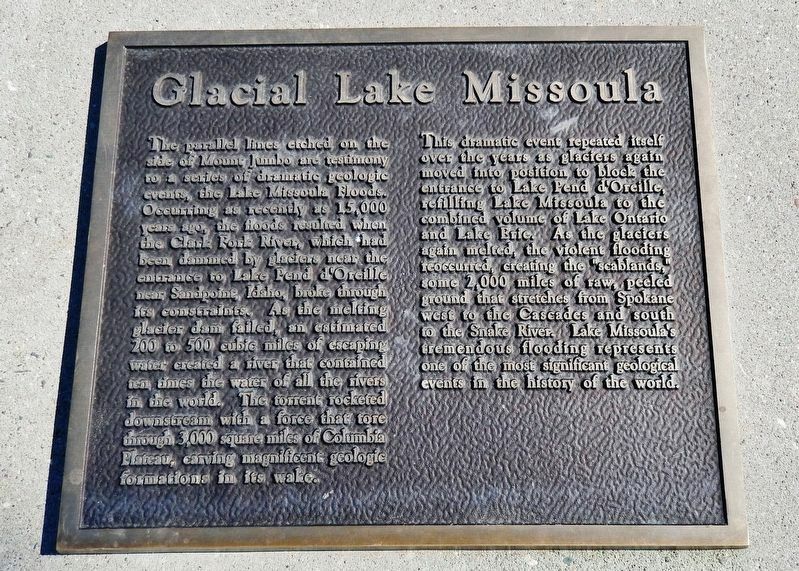 Search the internet for Glacial Lake Missoula. Credits. This page was last revised on February 26, 2019. This page originally submitted on February 24, 2019, by Cosmos Mariner of Cape Canaveral, Florida. This page has been viewed 25 times since then. Photos: 1. submitted on February 24, 2019, by Cosmos Mariner of Cape Canaveral, Florida. 2. submitted on February 25, 2019, by Cosmos Mariner of Cape Canaveral, Florida. • Andrew Ruppenstein was the editor who published this page.